I was introduced to American history by my parents during the 1976 Bicentennial. I remember vividly those trips to Philadelphia! The memories never left me. 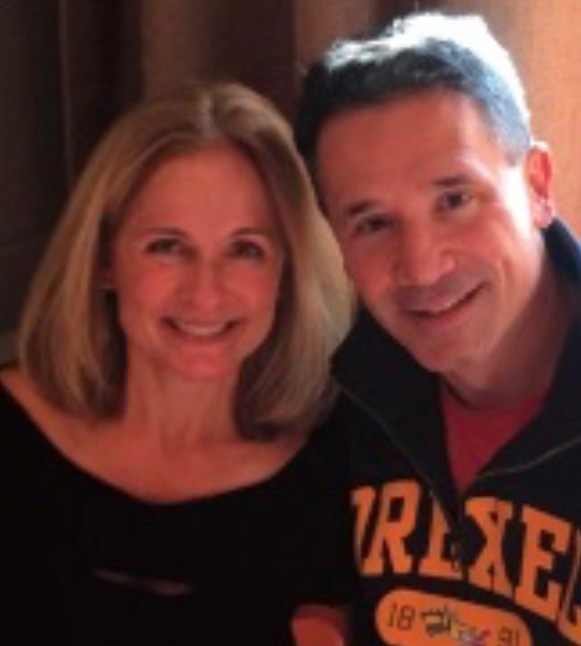 I went on to receive my Finance Degree from Drexel University. While there, I had an American History class where I learned that if the Sons of Liberty had not been formed, we would not be standing here today. They were the catalyst for our freedom. The colonists had free market and then England began taxing. They were horrified by this, and knew that signaled the beginning of even more taxation, which would in turn impede their trade. That’s when the Sons of Liberty were formed. They were a secret organization created to advance the rights of European colonists to fight taxation by the British government. Those members; Samuel Adams, Patrick Henry, Benedict Arnold and Joseph Warren, played a vital role in spearheading the Sons of Liberty. The men and women who helped shape America and the story of our freedom have always remained in my mind. It was Thanksgiving Day three years ago, and we were all at my brother’s house. 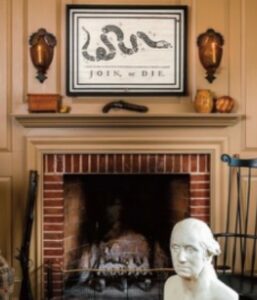 I was sitting across from a new tavern sign that my sister-in-law had just purchased from Colonial Williamsburg. It was at that moment that I decided I was going to create art inspired by that period that helped form our country. I went home that night and sketched my first sign. It was Benjamin Franklin’s Join, or Die. I gave it to my brother and sister-in-law. I started creating pieces for my family and friends. One day I received a letter from the Chestertown Tea Party Festival organizers…they reenact the Boston Tea Party… asking me to participate in their Memorial weekend show. My greatest satisfaction comes from talking to the people we’ve met at such shows, and seeing their overwhelmingly positive response to my work. 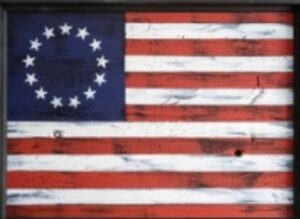 A reproduction of the American Revolutionary War flag by Philip Marc Sons of Liberty. If you could have dinner with a historical person, who would it be? I would love to know what was going through his mind in the final months of 1776. This period is considered by most historians as America’s darkest hour. He had lost every battle. His troop strength had shrunk ninety percent, his top generals no longer had confidence in him, his army had no supplies and our Congress was in hiding. He needed a miracle and he needed it fast. The fate of our entire nation, and our “cause” .liberty .lie in his hands. He devised an aggressive attack on a Hessian outpost in Trenton, NJ. He would cross the Delaware on Christmas night and march nine miles in a winter storm. Thirty percent of his troops didn’t have shoes – you could follow their path from the blood stained snow they left behind. He successfully seized the Hessian outpost without losing a single Continental soldier. He survived a second crossing/Battle of Trenton on January 2nd. A miraculous fog saved his entire army and provided him the necessary cover to escape Cornwallis. This allowed him to to stage another divisive attack on Cornwallis’ rear guard stationed at Princeton. What he achieved in ten days is considered the greatest military feat in the history of warfare. It shocked the entire world and emboldened our fledgling nation. He knew the fate of millions depended, under God, on the courage and conduct of his army. 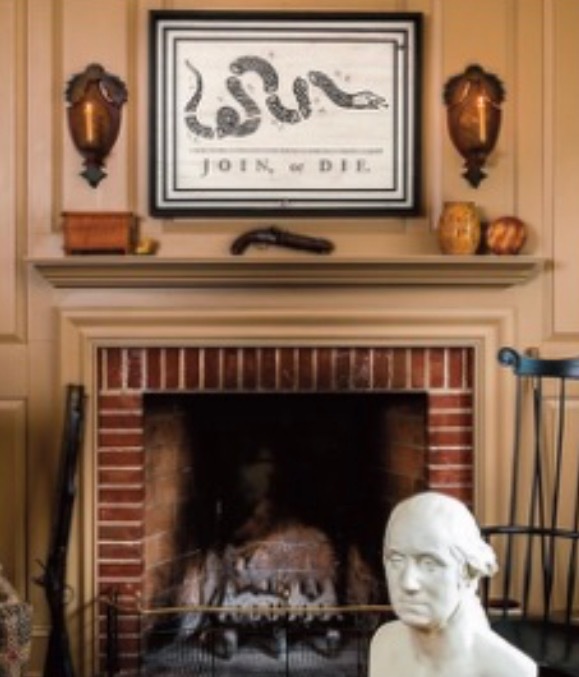 The company’s first reproduction sign was Benjamin Franklin’s Join, or Die. Philip Marc Sons of Liberty. How important is it to teach Patriotism to the next generation? Ronald Reagan said it best, “freedom is never more than one generation from extinction.” They used to publish pamphlets that would tell people about how we achieved freedom and now we are willing to relinquish it. They don’t know the greatness that changed the world. Thomas Paine said it well, “Those who want to reap the benefits of this great nation must bear the fatigue of supporting it.” Men and women have sacrificed so much so we can have freedom. We cannot forget or we risk losing it. Never doubt yourself. You will meet many people who tell you not to do it. I always thrive on hearing that and I want to prove them wrong. Hard work does pays off. While at Mt. Vernon the commander of the United States Air Craft Carrier George Washington bought a piece to hang in the ship, I was selected for EAL’s Best of the Best 4 years in a row and I had the privilege of designing a t-shirt for Washington Crossing gift shop. A line of t-shirts by Philip Marc Sons of Liberty. What would you describe as one of the keys to your success? A lot of ambition and hard work. Since I was a teenager, I have thought like an entrepreneur. I never give up and have endless energy. This is the best of both worlds to be able to work at something I am passionate about. 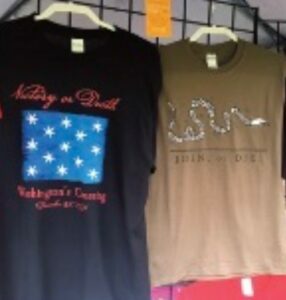 Ultimately, I want to create an American brand. A brand that celebrates our history. If people want to find out more about Philip Marc Sons of Liberty, where can they look? Check out our website and Facebook for frequent posts. Find Philip Marc Sons of Liberty in the gallery of our 3-day February wholesale show, February 3-5, 2019, at the Greater Philadelphia Expo Center.